well MS, while beyond grebt on stuff like “giblet pie” and “POISON”, is actually kinda hard to look VERBS of cookery up in, so this is a provisional answer until i have more perusing time, but “Fried potatoes, French style” (viz: crisps) shd be done in “clarified dripping”!! This year’s Ig Nobel prizes have been announced (Guardian article). The economics award goes to the man who invented karaoke, the medicine one to someone who claims a link between country music and suicide, but the best is the engineering award, to someone who has patented the combover for baldies. So Superman: The Movie had the tagline “You’ll believe a man can fly”. Babe should have had “you’ll believe a pig can talk”, because you do. Anthropomorphic fables throughout the ages have had this happen after all, Babe was finally the film where it happened. Or at least the first time they lip-synched the animals. It is amazing the difference that lip-synching makes. It ties the voices into the animals in the way voice-over (a la Look Who’s Talking Now) cannot do. And it may just be routine computer animation, but that basic chinnywagging is as convincing as any other big budget effect. Moreso because the story is so good. The story, The Sheep-Pig, was an old Jackanory classic. And like Jackanory, Babe is told with a happy gentleness, which counterpoint the moments of true tension in the film (the potential death of Ferdinand the goose, the feral dogs). And who would have thought One Man And His Dog had such potential for nailbiting tension*. In the end though it boils down to a few cute animals, some excellent voice-over artists and a director willing to take some remarkable gambles about what his viewers would watch. Its a film about a pig who wants to be a dog. Mad Max was clearly just a warm up for this. *Not the BBC who took the sheepdog trials off the TV almost directly after Babe, and its new audience, came out. This has later been admitted to be one of BBC2’s biggest mistakes. Dead Man’s Shoes is made by Warp films. Dead Man’s Shoes is made by Warp films. It shows from the soundtrack. It is quite possible that the company also imparted a touch of a minimalist attitude to this stripped down production too. Shane Meadows had vanished into an almost twee parody of himself in Once Upon A Time In The Midlands. In Dead Man’s Shoes he finally fulfills a lot of that promise, with what is a simple, grubby, nasty revenge film. Yes, I was not that keen on seeing a revenge film. But cleverly Meadows manages to get us to find the bad guys, those upon whom revenge is taken, amusing and human. Admittedly in a rubbish smalltown inept gangster way. But it is getting them to display their fearful fumblings alongside the flashback of their crime that manags to get these otherwise identikit wide boys a personality. Of course there is something quite nice about seeing rubbish characters who would otherwise be lauded in a Guy Ritchie film, get picked off. There is almost a suggestion that this is all there is at the heart of the film, so it is nice to see in the final third the film examine its own morality. A nasty revenge film that is both hilarious and deeply moral. Whodathunkit? My mother once told me of her childhood dread that gravity would fail, sending her hurtling upwards into space. When I have told this to people several of them have nodded in sympathy (her other great fear, that of fish that could walk, has met with less recognition). In reality, of course, being adrift in space like Major Tom or that guy from Tintin is unlikely to happen to any of us, because nobody with any sense is likely to allow us into space. We are more likely to become lost at sea, or in a desert. But these more credible fears are dwarfed by the sheer immensity and emptiness of space. This unexplorable hugeness is also the very appeal of space for amateur astronauts everywhere – many a fear is the close cousins of someone else’s desire. People often ask me if I would be happier deaf. That is the kind of sensitive talk that passes as conversations in the gin-haunts of Bloomsbury and Finsbury, and yes I suppose if music and banal conversation is all I get then deafness might be the way forward. However, I like the soft whispers in the night, the roar of a fully-laiden bus up the Pentonville Road and the sound of my own voice shouting at incompetents playing their din too loud next door. No, deafness was an option I disregarded a long time ago. Anyway, it is not as if music does not infect the other senses. The writhing of dancers on so-called music television. The tap tap of syncopation along with dunderheaded drum solos. The smell of leather trousers as worn by greasy heavy metal males. Even taste, the sense that should be safely housed within my mouth is tainted by the terrible taste of anyone who likes music. Especially house music. So I over the next five days I shall present to you my five senses of shame. And maybe a sixth sense too, since I can magically sense if music is terrible. The clue is, it exists. 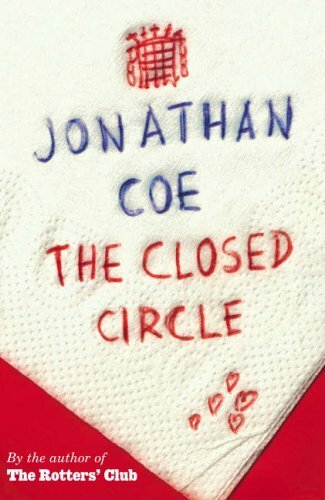 Jonathon Coe’s The Rotter’s Club (published 2001) was always intended to be Book 1 of a larger story, and Book 2, The Closed Circle has only recently come out. It is a page-turner no doubt (I read it very quickly), but that only takes it within the provinces of an insubstantial beach read, and disappointingly it rarely strays outside, demonstrating but a shadow of the author’s proven ability. To be fair it does manage to show some virtuosity in the variety of views and immersive voices, and for a Coe obssesive that’s enough to make it a worth-while read. But it is an easy read – and whether you think that’s negative criticism or not will determine whether you like this book. The book definitley does lack for Coe’s trademark “structured” gags though. Where the “missing footnote” in The House of Sleep recalled some of the wittier Ronnie Barker monologues (specifically the “Answering the Question Before last” Mastermind sketch), Closed Circle degenerates into the song medley where the Ronnies have to rhyme something with “flickers” and fail to say “knickers”. Oh my sides. In a great bit of shooting-in-foot, the best of the heavily telegraphed sitcom punchlines is actually designed to alienate possible newspaper reviewers. That made me laugh though. It is also unfortunate that for every sharp satirical point made about media/politics there’s often leaden social observation to wade through. Amongst the many loose ends of the first book, there are two main mysteries – what happened to the missing sister, and who drugged someone as they took a crucial exam (Steve Richards). One of these is given an explanation that is to the satisfaction of the characters’, if not the reader’s. The “real” solutions are there for you to pick up in the text, and are reasonably obvious, but the details only come out in Circle. This, quite frankly, ruins the smug feeling that the reader gets (or at least this reader got) from the first book. So much so it’s tempting to suggest that if you did get it in Book 1 then don’t go out of your way to read Book 2. There’s a maxim that good authors work out what the most important thing is in their story then leave it out. In this case Coe could have left out writing the entire book, which would have not satisfied his contract, or he could at least have left some mysteries explicitly hanging as an exercise for the reader. LIES AND THE LYING LIARS ETC. NEWS FEED: Bono says U2 have deal with fans. Two crap albums and they are out. Surely they have reneged on this deal then. Back in 1981 when they released October. Take this to the High Courts now, a deal is a deal. In other news, Britney is writing a ‘letter of truth’ to her fans, to be posted on her website by the end of the month. “It is making closure with a lot of things – I think this is my ultimate truth”. You wouldn’t think it would take a whole month to write the truth about Britney but she does have plenty on her ‘plate’ at the moment. Meanwhile we have exclusively obtained an early first draft of this letter of truth. Sory about all teh records. Its hard to do a picture thread without a picture, but as my Bread and Butter pudding was a companion to Chris’s squirrel I feel I need to post it. But a picture would say everything, when I turned up after a gnarly and damp journey I presented the party with a baking dish containing something very, very yellow. The pudding was half cooked; I thought I would finish it off around there, and the custard had been a touch thicker than planned (too much cream). Moreover the eggs were the brightest I had ever seen, leaving the custard a resultant virulent* strain of orangey-yellow. Like I say I do not have a picture, so you will have to make do with considerable less than a thousand words. *Tim suggests I should not use virulent in this manner, and in retrospect I tend to agree. However at the time it was the word I used and is being reported for journalistic accuracy.